Lance Vance is "a drug-dependent wreck"
Golf caddies appear, from this we can ascertain that Leaf Links is still a golf course. The game's radio stations will contain "hundreds of top tunes"
"A lot of new vehicles, including all sorts of aircraft" are to be included, on the whole, a "mixture of old and new"
The vehicles in the game will be a "mixture of old and new"
Secondly, Official PlayStation 2 Magazine France have also received a preview. As my ability to read French isn't too strong, I can't clarify that the following information is 100% accurate (online translators aren't good). If you speak French fluently please let me know via PM or E-Mail if you can clarify the info. The magazine saw fairly empty streets but Rockstar promised that they will be twice as full with pedestrians and vehicles when the game ships. Rockstar supposedly has a big surprise planned for the WiFi Multiplayer mode. There's no hint of what this might be though. Thanks to Ultimate Taz for his scans of Games Master, and Genius for the OPS2M France info. You may recall in yesterday's news post that CVG took down their screenshots of Vice City Stories. We've now managed to get hold of the screenshots, as well as a couple of old artworks, now in excellent quality. None of the screens are new, but they're much nicer to look at than the poor scans people are making. Dmac_91 has posted on our forums that CVG have some high quality screens up on their site. Unfortunately there aren't any new shots, and the screens all have huge watermarks over them. They've come from a disc that was handed out to the press in Rockstar's meeting rooms at the Leipzig Games Convention in Germany. This of course means that other press members will have the screens, so we'll add them to our gallery as soon as we get our hands on unwatermarked versions. UPDATE: It seems the page and screenshots have been removed. We'll try and get the screens added to our gallery as soon as we can. The latest issue of PSM magazine is out in the United States of Americaland, it includes a preview of Vice City Stories and is actually the first US magazine to even get a preview of the game. The following details have emerged. The Cure are one of the artists the magazine heard on the radio, expect songs from them in the game. You'll be able to see "considerably farther into the distance" than in Liberty City Stories thanks to the improved draw distance. The magazine's writer got to play four missions, lasting on average 10-15 minutes. This is a substantial improvement over Liberty City Stories' mere 5 minute average. Custom Soundtracks will return - Using the Rockstar Custom Tracks application you can add your own music to the game. Our friends at GTAUnderground have also posted a couple of new artworks that were featured in the magazine, one of the jet ski in action, the other portraying the Vance brothers. Finally, we have some nice digital screenshots to show you, not from IGN or Gamespot or some other large gaming website, but from Game.co.uk, Europe's leading specialist games retailer. You can view all the screens on our VCS Screenshots page. The Official PSP Guidebook Magazine, yet another UK publication, has a rather uniquely styled preview. An interview with Mr. Rockstar on the VCPR radio station. In terms of the narrative, the new trailer park which we found out about earlier is going to be a key part. There are more than 70 storyline missions to play through. Urban renewal is the term used to describe the period in which Vice City is going through. You'll see many familiar landmarks uncompleted with scaffolding jutting out. The soundtrack still isn't finalised. Rockstar realise Vice City's soundtrack was so good that they're trying even harder to better it now. Foliage and explosions have been improved and look a lot nicer than they did in the original Vice City. The AK-47 and Sniper Rifles return, the full weapon list is yet to be finalised. There's a suggestion that you'll be Monster Truck racing at the Hyman Memorial stadium. Another subtle suggestion implies that the basketball minigame may make a return from San Andreas. Keep in mind those last two bullets aren't confirmed, they're just suggested. Thanks to DeAnO_GTA~MaStEr for posting about this at GTAForums. In other news, we hear Vice City Stories will be shown to select press members at the upcoming Games Convention in Leipzig, Germany, according to Take Two Interactive Germany. This is behind closed doors though. But at least we can expect some different previews from some more publications. Keep in mind we still haven't even had a US magazine with a preview yet, so if you live in America look out for any magazines with previews in upcoming issues. German magazine Play The Playstation has a few more details on Vice City Stories. Again we are still only seeing European and Australian magazines with previews, not one single American publication has received a preview yet, which is somewhat strange considering past GTA games' previews. The game will have the same outfit changing feature as Vice City and Liberty City Stories, you still won't be able to change individual garments as you did in San Andreas though. Thanks to German fan site GTAReactor.de for the news. It seems that this magazine may not have actually received a preview of the game, and what they've actually done is (poorly) translated information they've found on fan sites. The screens they have are blatantly stolen from a certain fan site, and also, they stupidly refer to Vic as 'Vic Lance' (*laughs*), not Vic Vance, as we all know is his real name, and that Lance is actually his brother. Take this information as you will, but we reckon this magazine never received a preview, and as such, doesn't contain any factual information. Coca-Cola have recently produced a brilliant advert, parodying the world of GTA. The twist being that the character is now a good guy. In the advert we see the character (who bears more than passing resemblance to Claude from GTA3) hijacking a car and driving eratically, scaring shop owners and what not. With various other references to GTA (including a SWAT helicopter) and a catchy background tune, I think you'll like it. Thanks to everyone who notified me of this link, there were many of you. The Vice City Multiplayer team are holding a public beta test for version 0.2 of their multiplayer mod for Vice City all this weekend. Head on over to ViceCityMultiplayer.com where you can download and install the mod. For further information you may want to join their IRC channel. As I'm sure you were aware when we posted yesterday, GamesTM is available today in the UK, and we now have more information on Vice City Stories thanks to their preview. Binoculars will be available at all times, rather than just being available on one or two missions like the camera was in Vice City. Phil Cassidy is to return. GamesTM say he appears in one of the game's loading screens. The city features enhanced dynamic lighting effects, essentially making Vice City look a nicer place. Unfortunately we can't post scans as we'd be breaching the copyright, however, our friends at VCS:PSP have posted some nice high quality ones you can look at for the moment, not sure how long they'll be up though. GamesTM, another UK publication, goes on sale tomorrow, and according to Kikizo, Philip Michael Thomas who voiced Lance Vance in Vice City will be returning in Vice City Stories to voice the same character. Thomas became world famous playing "Tubbs" in Miami Vice, the legendary TV series which Vice City drew inspiration from. Amongst other details the magazine gives are the fact that once again gamers will be frustrated by the annoying 'pop-up scenery', whereby objects will suddenly appear when the player is in close range, often resulting in dissatisfaction for unlucky gamer. The magazine also suggests the game will revolve heavily around Vice City's waters. Since the article (like others recently) contains inaccuracies we shouldn't take this as 100% confirmation, but it's a pretty good indication. You can check out Phil's colourful career at his IMDb page. The latest UK edition of Official Playstation 2 Magazine has a four-page preview of Vice City Stories. The magazine, available only to subscribers until Thursday, seems to have virtually the same hands-on preview that Australian GamePro Magazine had, which unfortunately for us means there isn't a lot of new info. Two sports cars, the Phoenix and the Stinger are confirmed to return. In a couple of screenshots we can see Vic with a tattoo on his right arm, however, whether or not this is customisable as in San Andreas is unknown. The screenshots (some of which are the same) are better quality than those printed in GamePro, we'll hopefully have some images to show you shortly, possibly even an official site update soon. Expect a lot of new info then. Thanks to Neil for the info. 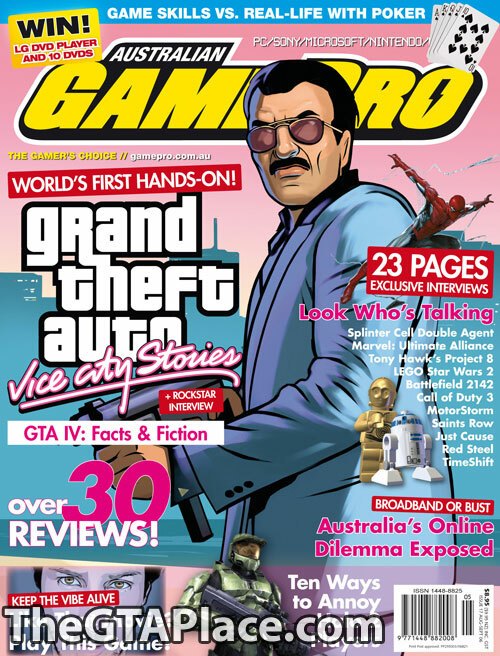 The latest edition of Australian GamePro magazine has an exclusive interview with Rockstar. Editor Chris Stead has posted on GTAForums letting us all know about the magazine. We've got scans of it which he has allowed us to post, and we've got details of vital information and new features below. Victor Vance is the main character. Vic is a 28 year old marine in peak physical condition. VCS is set in 1984 and is "much" bigger than Vice City, there are also lots of familiar buildings that we see just entering development. Improved Animations - The animations have been improved massively from the other GTA game. It is now much more realistic and the character's emotions are are more true. New Vehicles - JetSki's for example, are in the game. Vic does have the ability to swim. The game will feature a multiplayer mode similar to that in LCS. New water effects, shower the streets with spray from your jetski. Improved draw distances (again) - better than other titles. There's a new theme park on Ocean Beach - it includes the "Chunder Wheel" - a large ferris wheel which you can ride on in first person view! Trip Skips return, this is where a taxi appears after you die and can take you back to the start of the mission you were attempting.